As a special birthday treat, the very nice people at the Grand Hyatt, Muscat let Mrs Sythe & I have a sneak peak at the menu and the foods that are going to be available at Marjan between the 15th and 26th of January. Marjan the restaurant itself is situated outside by the end of the pool near to the beach, it's a pretty place to sit, but just like Tomato at the InterCon, it's a winter-only venue for dinner (but it's open year-round for lunch). The first thing I noticed was that there were actually 2 menus - 1 was the main menu for the special themed event, and a second smaller Sushi menu. Being a huge fan of Sushi and Sashimi, I had basically given up hope of getting any decent Sushi anywhere in town except at Tokyo Taro down in Ruwi. 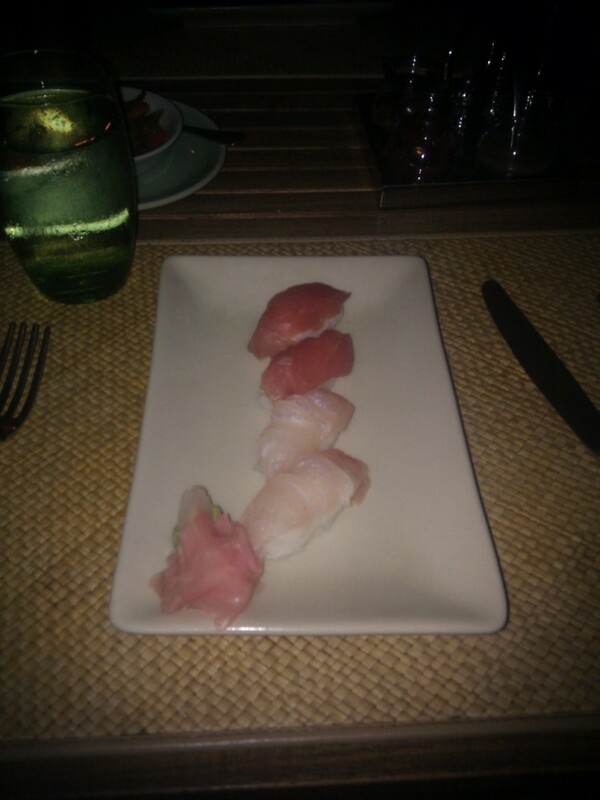 I can report that the Sushi I ordered at Marjan was amazing, I really enjoyed it and will be going back for more - and at RO 1.500 for a Sushi dish for a starter, I think it's attractively priced. Each menu had a little light clipped on to it so you could clearly see the menu items - a nice touch I thought. 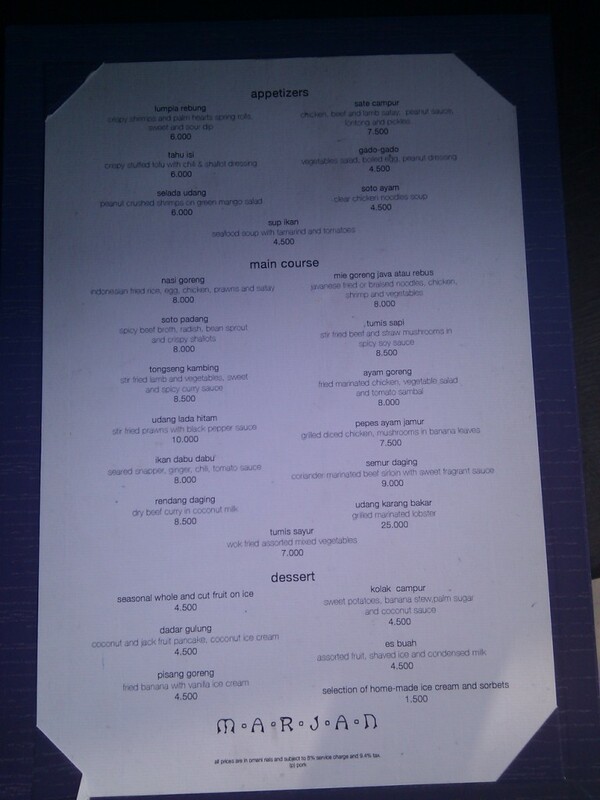 Click the pictures to see the menu and their prices. 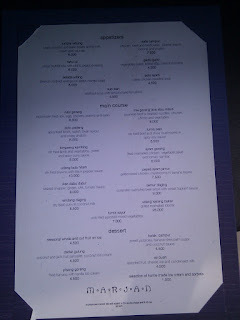 Speaking of pricing, the entire menu was, I felt, cheaper than I would have expected for a 5* hotel's restaurant. All the Entree's are priced between RO 8 and RO 10 (with the exception of the RO 25 lobster). To put that into contrast, Tomato @ the InterCon - a pretty much like-for-like setting for a restaurant (5* hotel, outdoor seating only) - has a standard entree priced at RO 8 - 15. 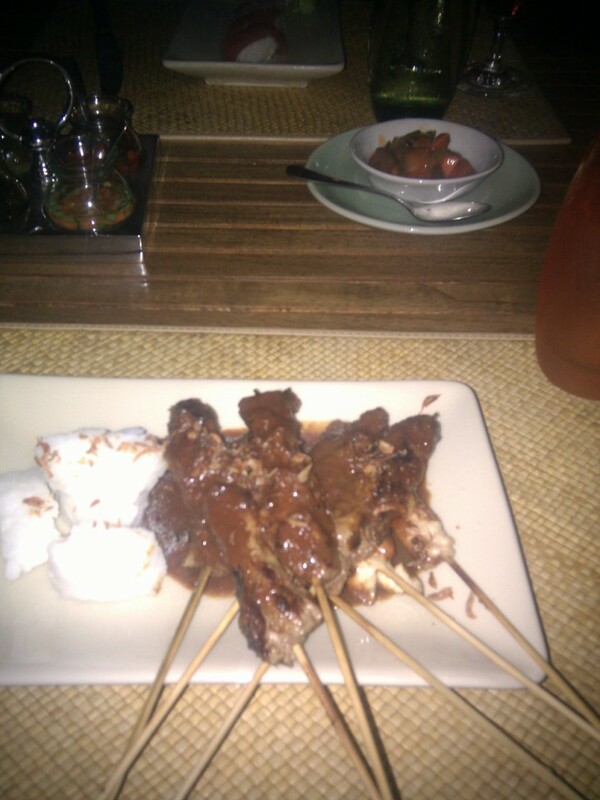 To start, we ordered the most expensive starter, the Chicken, Beef and Lamb satay sticks (RO 7.5) and 2 portions of Sushi (RO 1.5 x 2). 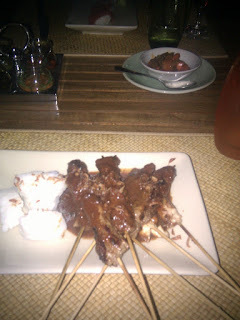 Both were amazing, and the portion size of the Satay was a lot more than expected. As I already wrote above, the sushi was really good, better than the stuff served in Shining Shatti thats for sure. I do have to apologize, I (unlike Andy and blue_chi) do not have a fancy camera and am somewhat limited with the pictures and the quality. A fancy camera, and how to use it, has been on my to-do list for quite some time. I'll get there in the end! 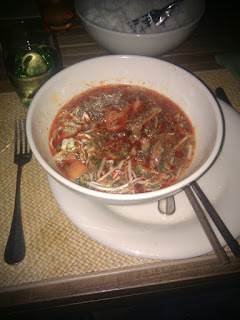 After the tasty starter (and more filling than expected) we ordered our main courses, which were the Soto Padang (spicy beef broth, radishes, bean sprouts and crispy shallots) for RO 8, and also the Semur Daging (Coriander marinated beef sirloin with sweet fragrant sauce) for RO 9 (second picture below). Now, I appreciate that these dishes may not look particularly well presented, but it's the camera! They were both really, really good. Now, the atmosphere around the restaurant is also worth noting - it was very intimate with well laid out tables with subtle, yet sufficient lighting. The view of the pool and the main hotel building was also nice, see below (this was the view from my seat). There were also a duo of guitar players walking from table to table taking requests and then singing them. By the time they got to our table I'm afraid I'd set the bar too high for them by asking them to play The Who's Pinball Wizard, but they more than made up for not knowing that song by playing Sitting on the dock of the bay by Otis Redding, and then singing me happy birthday in 3 different languages, which was fun :) Here's a snap I took of one of they when he was belting out round 3 of Happy Birthday in what I can only guess was Indonesian. 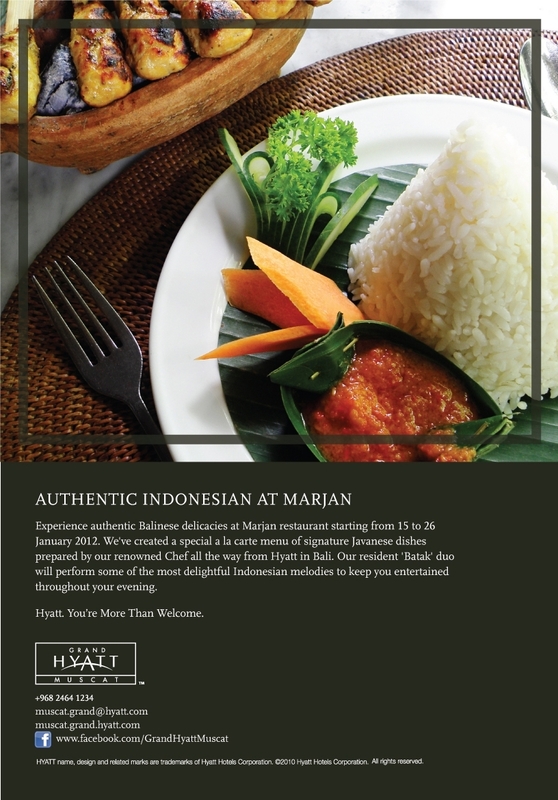 All in all, we had a great time, and the Authentic Indonesian experience starts at the Marjan restaurant at the Grand Hyatt on January 15th and runs until the 26th. You can book tables by calling the hotel on +968 2464 1234. 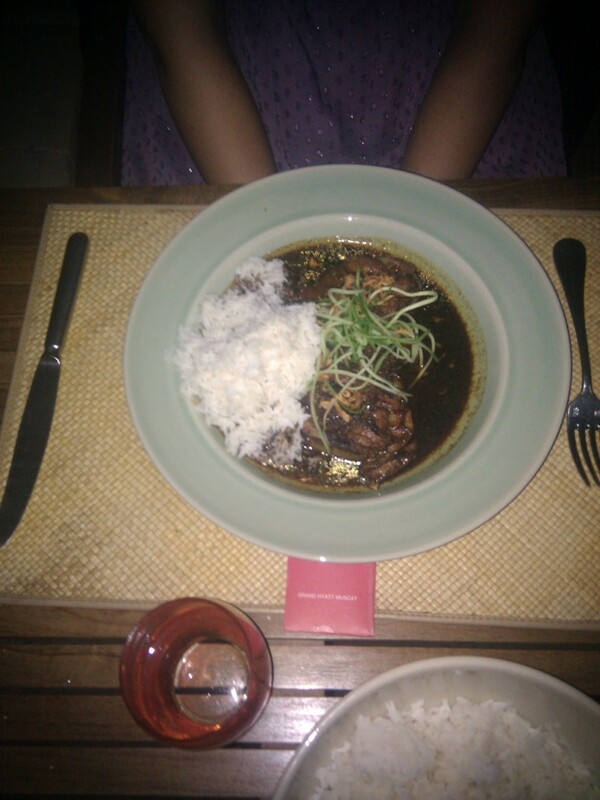 We loved our evening out at Marjan as well. 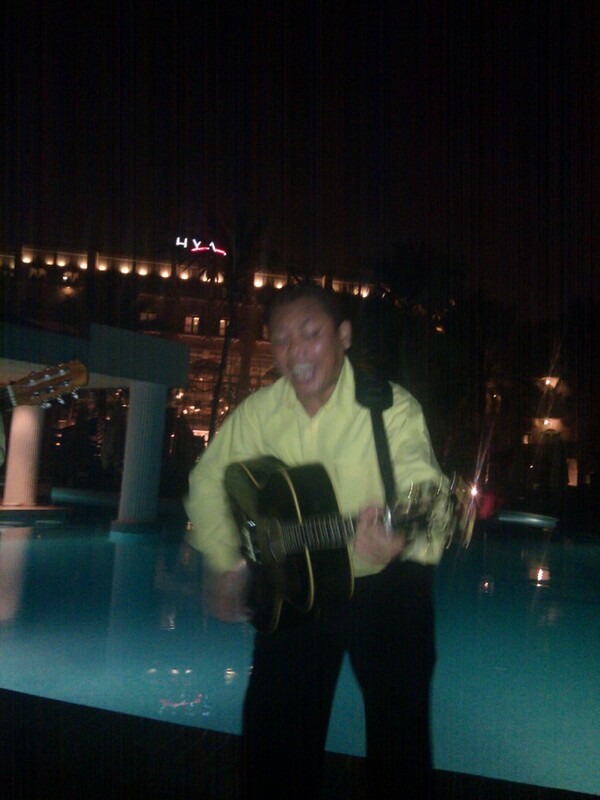 Those guys on the guitars certainly add to the whole mood! Great to see you had a fantastic birthday out! 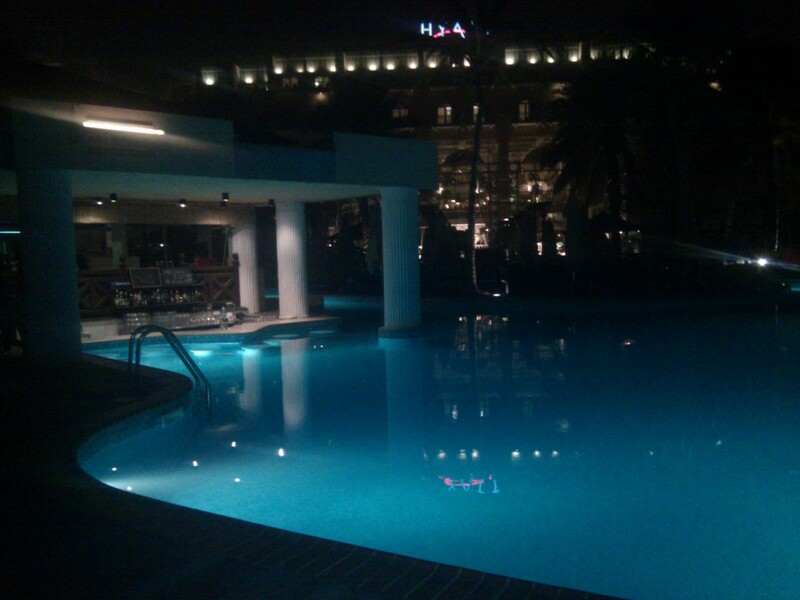 Yes, we had some great evenings there by the pool. 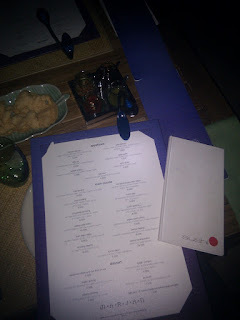 This restaurant is Muscat's best kept secret and never a miss!!! Even without the Balinese promotion, the menu is top; the Chef is actually Indonesian all year round, it makes a difference. Cheers. Best kept secret? That's a little disappointing. Great food, but the guitar players can be a put off. Location is great, however, the food is rather bland, I lived in SE Asia for 8 yrs and this is not what Indonesian food tastes like. At all. Prices not so reasonable, however, being at the Hyatt in overpriced Muscat, par for the course. The singers while a nice touch, were far too loud and prevented any conversation at reasonable volume, had they been on the other side of the pool as background music, probably would have been perfect. Overall rating: unsatisfied, will not be returning.